Missionary Decade starts in UGCC. All of us are ought to read and listen to the Word of God daily, as well as pray for a missionary work of our Church. Because today, me and all of you are called to preach repentance and forgiveness of sins to those, who might not know it yet. Everyone who is baptized is called to be a missioner. Head and Father of Ukrainian Greek Catholic Church His Beatitude Sviatoslav said to the faithful during his homily in Patriarchal Cathedral of Resurrection of Christ on the day of Ascension. 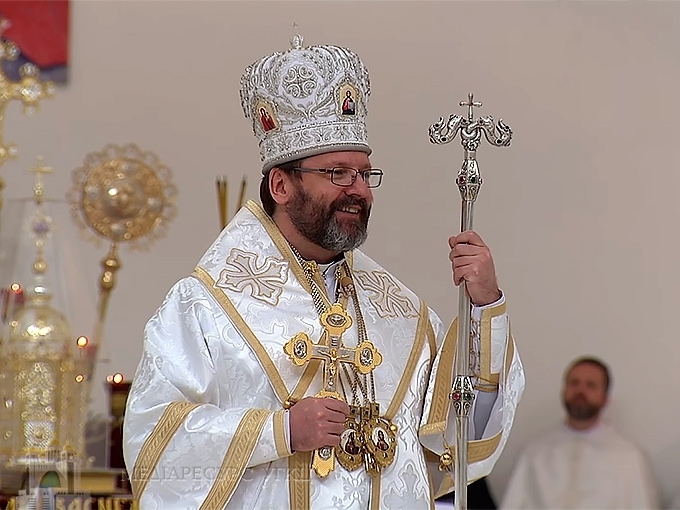 Bishop Josyf Milyan, bishop-Auxiliary of Kyiv Archeparchy co-served Head of Church. The preacher outlined that Jesus Christ in today’s feast wants to show us that in His Divine nature He is coming back. But in its human’s nature this feast is an ascension of a man. Today He is demonstrating all of us what our destiny and our vocation truly are. “In today’s feast He reveals that human’s life and even life in a human’s body is something much more than just a life in this world. Today Christ is ascending to heaven and brings up humanity with Him. Today, coming back to His Father, sitting at His right. But not alone. In His Ascension He lifts all of us, those who believe in His resurrection, those who belong to Church, what is a body of our resurrected Savior, who ascended today”, the Major Archbishop said. The second part of the Gospel tell us about a mission, why do we need it for. Why He, being God, became a man. Why Christ, - God’s anointed, had to suffer, die and resurrect after all? What is His mission as a Son of God? “It is all, - the preacher assumes, - apostle Luke sums up in one short phrase: repentance for the forgiveness of sins will be preached in His name to all nations. Christ died and resurrected to open us a way to heaven. On the one hand, this way is called repentance, in other words a realization that we are beyond heaven and God’s grace. We need a salvation”. His Beatitude Sviatoslav also referred to a special occasion which starts these days in life of Ukrainian Greek Catholic Church. “Today, in Ukraine and up to the end of the world: in Australia, Argentina, Brazil, Canada, USA – we start Missionary Decade of our Church. Every day all of us have to read and listen to the Word of God, as well as pray for the missionary work of our Church. Saint John Paul II used to say: if Church ceases being a missionary one, doesn’t preach the Word of God, resurrected and ascended Christ, doesn’t forgive sins and make the part of a salvation plan those who are not yet Christians, then Church stops being a Church, - the Head said. “Starting from today and till Pentecost, let us pray for the missionary activity of our Church. I wish us to feel a responsibility for spreading Gospel among those who are not yet Christians. Let us ask today for an ability of every member of Ukrainian Greek Catholic Church to comprehend their own vocation, to reveal their Christian apostolic message in a modern life of our Church”, asked Head of UGCC, referring to faithful.